I’m not famous for much, but one thing people recognize in me is my particular hate for the public transportation system in Florence, Italy. My daily misadventures on the bus have led to the creation of a special hashtag for the bus company, and people often ask me to regale them with further tales of delays, stinky companions and more. My route from home to work that takes 13 minutes by Vespa often takes an hour or more on the bus, requiring extreme patience every day. 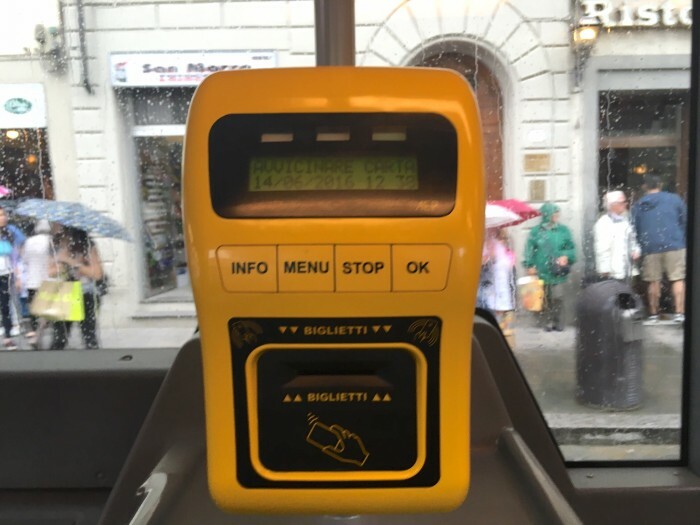 In the digital realm, I seem to attract complaints about bad bus experiences from upset tourists who receive fines and then find my article “how to take the bus in Florence and not get a fine“. I wrote this article back in 2010 to try to help visitors, but of course they tend to look up this information after the fact, not before they make costly mistakes. In all cases, the tourists in question had purchased bus tickets but had not yet stamped or “validated” them in the machines. Others have written me with stories about how it was too crowded to get to the machine. I frequently witness this in person as well, even more so now that they have removed the machine at the back of the bus, leaving only one at the front. Sometimes the staff disbursing fines have been nice, and the people accepting them have been polite. Sometimes, unfortunately, there are disgruntled bus workers who are methodically attempting to ruin the tourist economy through bad communication. Main point: wherever you go in the world, it’s your responsibility to find out how to use public transportation or any other systems that will impact you and the people around you. Unfortunately, in Florence, there is not signage in major tourist areas explaining the bus system, in clear English, as there should be. The only way you will find out is to read about it beforehand in your guidebook or in a blog post like this one. You can buy a bus ticket at tabacchi stores indicated by a T, that often have an orange ATAF symbol in the window – many bars and newspaper kiosks sell tickets. You can get single (€1.20) or multiple trip paper tickets. There are also electronic tickets with an RFID chip in them for a minimum of 10 trips. Tickets are available for a surcharge (€2) on the bus by asking the driver, but attention: the driver may be out of tickets, or may be unable to provide change. If they cannot sell you a ticket, this unfortunately does not count as good enough, and you should get off the bus. Finally, if you have an Italian cell phone, you can send an SMS and get a bus ticket. It costs €1,50. Send a text that says just “ATAF” to 4880105. Remember, it’s your responsibility to get a ticket. If you don’t have one, or you don’t validate it, you cannot complain if you get a fine! You are also responsible for validating or stamping the ticket. The verb in Italian is “validare”. If you have a paper ticket, you must insert it into the machine at the FRONT of the bus (they have recently removed the ones at the back). If you get on at the center or back, you must make your way to the machine no matter how life threateningly impossible this is. It is totally acceptable to ask people to help by holding up the ticket and making the motion of shoving it into a hole (“timbrare” – to stamp). People will pass the ticket along until someone stamps it and will pass it back to you. Make sure you look at the ticket and can see the hour properly stamped on it. It is not enough to just stick it in the machine, you have to be able to see the writing, otherwise you are liable to get a fine for not stamping it. If you purchase a ticket by sms, you need to do this before you board the bus. This means that during the potentially interminable wait at the bus stop, even if it might show up god knows when, you need to do it before getting on. If there is a controller the moment you step on and you haven’t done it yet, you get a fine. Furthermore, like the stamping, you need to make sure that you get the sms receipt back from the system that says you have a valid ticket. If you don’t get the sms back, it’s like you didn’t buy it. With the electronic “carta agile” you need to hold the card up to the machine and wait til it beeps feedback. On the screen it will say “corsa scalata”. Make sure you use the right method for your ticket type. Frank, in his comment above, had a paper ticket but thought it was an electronic one, and that’s how he ended up with a fine. The center of Florence is small, so hopefully you won’t need to use the bus at all. 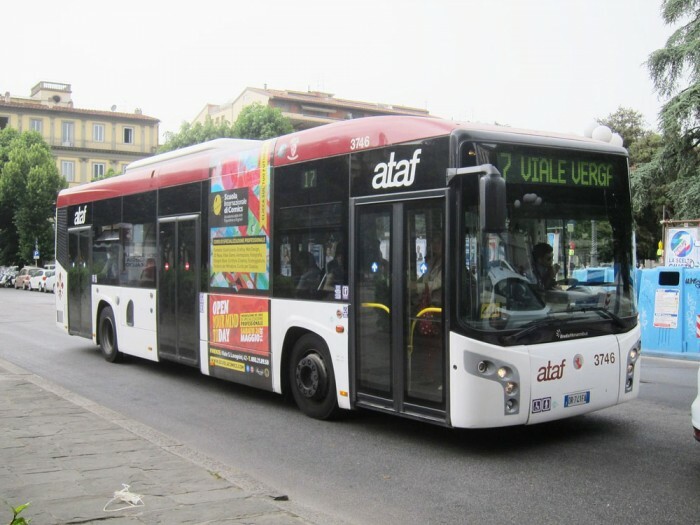 But if you have mobility problems, or if you want to visit neighbouring Fiesole, you’ll need to take an ATAF bus. To figure out which one to take and how long it should take, use maps.google.com and insert your dates as well as travel times, choosing the public transportation option on the map. This is more efficient than the ATAF website or app. To find out what time the bus is scheduled to come, or where it should go, while at the bus stop, it’s a bit more complex. Each bus number should have the timetable posted, and at the top there is a line with dots to represent the stops, and an arrow to represent the direction of travel. If you’re not familiar with the stop names, it’s hard to know if this bus is going where you need to go. Regular riders are always happy to help indicate your stop, and may also help you find the right bus while waiting. Below the stop list, there is a list of times the bus should arrive, though consider that these are quite approximate since the bus depends on traffic which is often really bad in the city. Hopefully if you’ve followed the instructions, you won’t get a fine! But unfortunately many people will still find out too late, or end up in ridiculous circumstances beyond control. Unfortunately, there is really nothing you can do: if you don’t have a validated ticket, no matter what the circumstance, you will get a fine. Controllers tend to make sure tourists pay it right away on the spot, because they know you won’t pay at all if they let you out of their sight. Many people ask me if they will be banned from entering the country if they don’t pay. Probably not, but these days it’s unlikely that you’ll get away from the bus stop without paying up anyway. Even if you are sure you are right and unable to communicate with the bus controllers, there is little you can do. Patiently asking to speak to the police may be an option. Technically, you may contest fines (“fare ricorso”) in writing, however, if you challenge the fine and are still “found guilty” (and by what method, I do not know), you will pay a higher fine than the original 50 euros per person. If you don’t pay at all, or if you challenge and lose, the fine goes up to €240. Florence parking: now scooters pay too!